ybp and formed the respective “local” subclades of P314, M222, L226, which largely populated the Isles. sents an example of application of DNA genealogy in studying the history of mankind. deed, the claims were based on no data. Such data never existed. was somewhere in that vast region. of one or the other of these terms is suggested by the context. 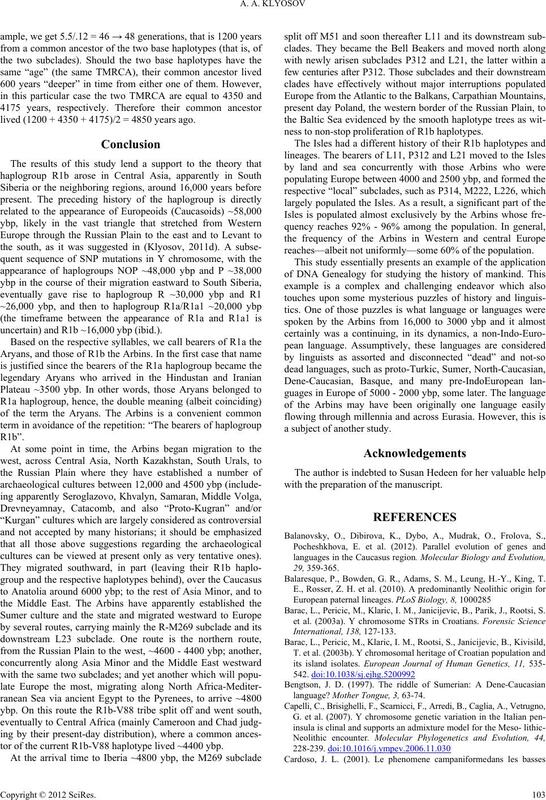 haplogroup R1a (Klyosov & Rozhanskii, 2012a). ethnicities (Hazak R1b1b1, Tu R1b2b, and four Naxi R1b2b). contain the most mutations in their haplotypes. years before present (Klyosov & Rozhanskii, 2012b). and three in Figure 3. Asia (Uzbeks, Tajiks, Tuva, Uighurs, Kazakhs) (Klyosov, 2008a). to the common ancestor in both instances. between Europe and Asia, on both sides of the Ural Mountains. went through a severe bottleneck(s) of the population. deeper in time, to at least 16,000 years before present. 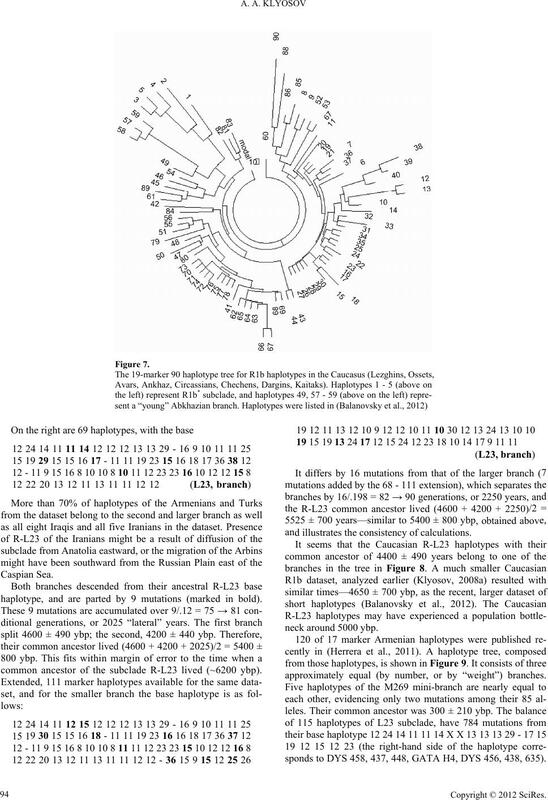 to the right branch in Figure 2.
d its common ancestor lived 3050 ± 600 ybp. ancestral to many European subclades of R1b1a2 haplotypes. kirs, Kalmyks, Tuva, Tatar, Kabardin, Russian, and Altayan). in the tree as a reference branch). Anatolia (Klyosov, 2010d); R-L23 was certainly not alone there. 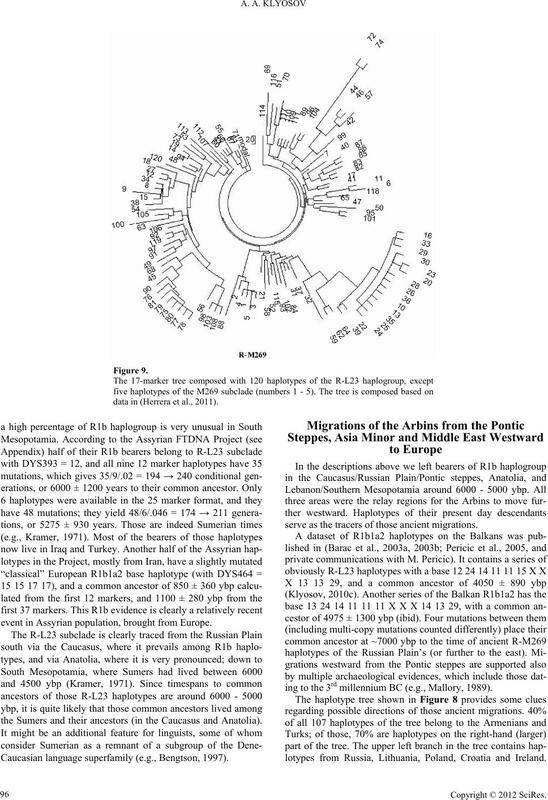 haplotypes, and eventually dispersed across Europe.
. Again, a number of their sub-branches are quite “young”. d its bearer lived 6575 ± 700 ybp. it was calculated for the distinct branch. oon and Chad, where R1b-V88 bearers live today. Caspian Sea, in the Western Iran. L21. They are typical and widespread European haplotypes. et al., 2011; see also Klyosov & Rozhanskii, 2012). sent haplotypes from Turkey, Armenia, Italy, France, England. sents Ukraine, Belarus, Poland, and Kazakhstan. 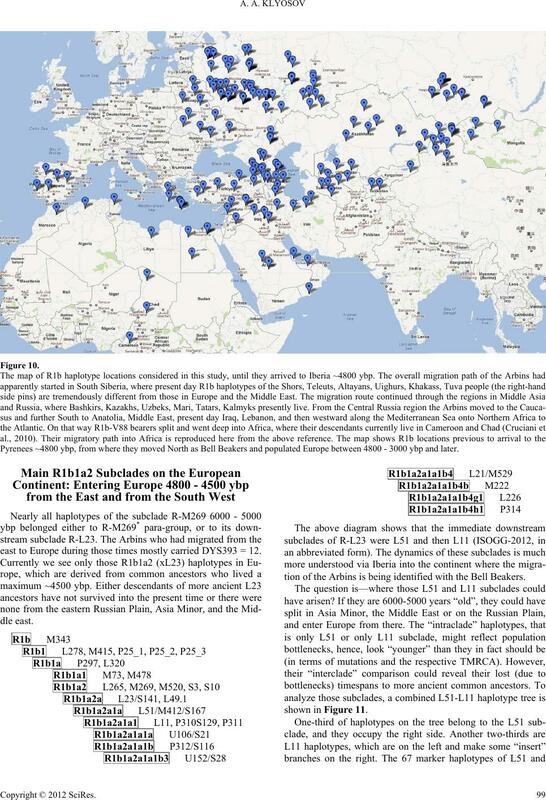 next 10 - 9 thousand years, to about 7000 - 6000 ybp. Caucasus and further South, to Anatolia and the Middle East. 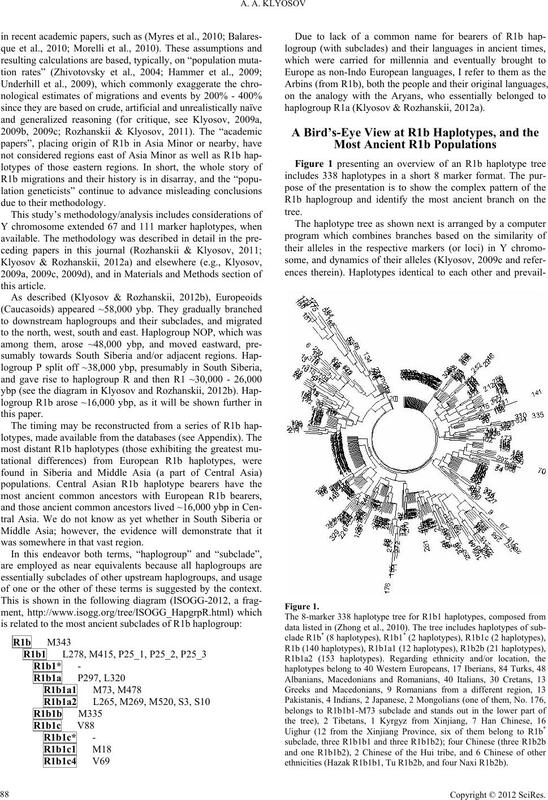 haplotype), R-M73 (10 haplotypes), and R-U152 (8 haplotypes). Russian Plain and then the Caucasus. 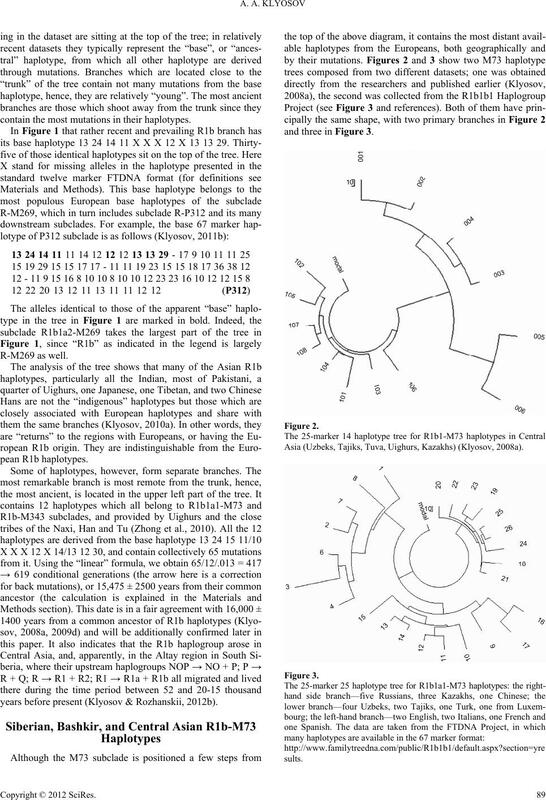 nor has analyzed the haplotypes in the manner presented here). haplotype, and are parted by 9 mutations (marked in bold). 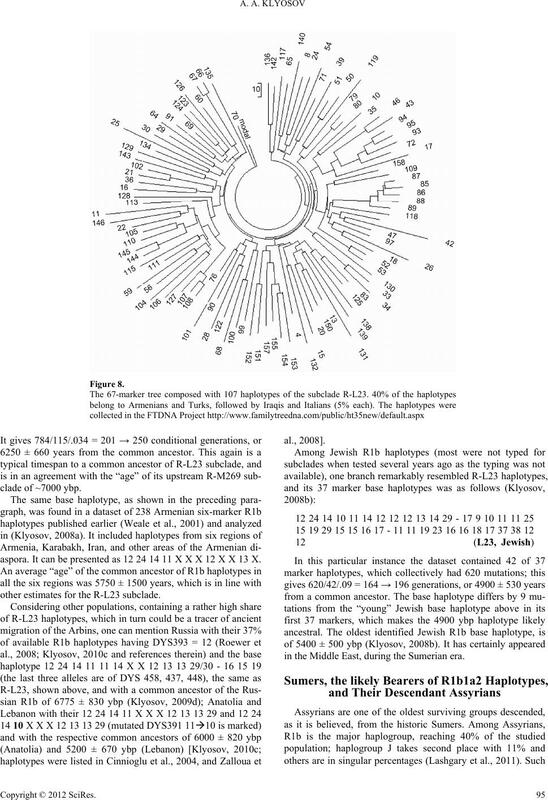 common ancestor of the subclade R-L23 lived (~6200 ybp). d illustrates the consistency of calculations. approximately equal (by number, or by “weight”) branches. sponds to DYS 458, 437, 448, GATA H4, DYS 456, 438, 635). aspora. It can be presented as 12 24 14 11 X X X 12 X X 13 X.
other estimates for the R-L23 subclade. in the Middle East, during the Sumerian era. data in (Herrera et al., 2011). event in Assyrian population, brought from Europe. the Sumers and their ancestors (in the Caucasus and Anatolia). Caucasian language superfamily (e.g., Bengtson, 1997). as the tracers of those ancient migrations. ing to the 3rd millennium BC (e.g., Mallory, 1989). lotypes from Russia, Lithuania, Poland, Croatia and Ireland. in Europe during those times. tween 4500 and 3500 ybp. Europe in all possible directions. 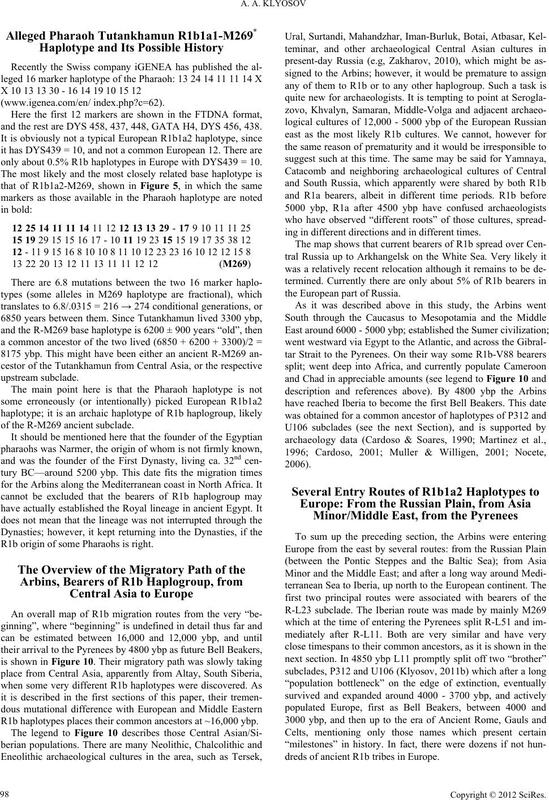 and the rest are DYS 458, 437, 448, GATA H4, DYS 456, 438.
nly about 0.5% R1b haplotypes in Europe with DYS439 = 10.
of the R-M269 ancient subclade. R1b origin of some Pharaohs is right. ing in different directions and in different times. dreds of ancient R1b tribes in Europe. Pyrenees ~4800 ybp, from where they moved North as Bell Beakers and populated Europe between 4800 - 3000 ybp and later. deed consistent with 4600 ± 535 years for the L51 subclade. = 4850 ybp. It seems that L11 split off only ~250 years later. 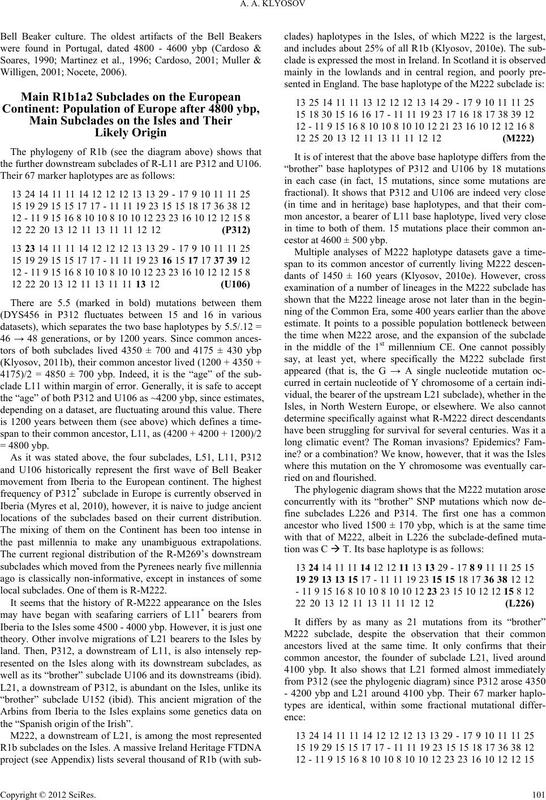 the further downstream subclades of R-L11 are P312 and U106. locations of the subclades based on their current distribution. the past millennia to make any unambiguous extrapolations. local subclades. One of them is R-M222. well as its “brother” subclade U106 and its downstreams (ibid). the “Spanish origin of the Irish”. cestor at 4600 ± 500 ybp. NA genealogy of the Arbins in Europe and Asia. YSearch, and in peer review publications. ples are based on specific cases in this study. 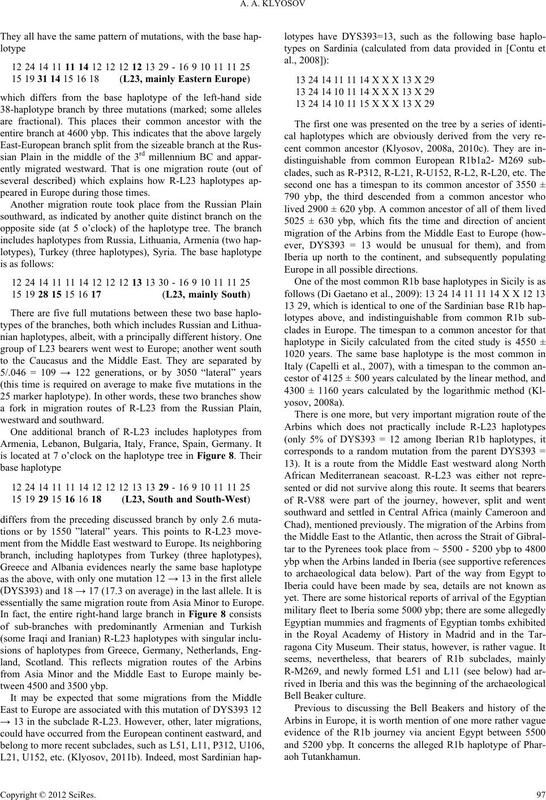 ancestor of the haplotypes to be equal to 15,475 ± 2500 years.
. M., Janicijevic, B., Parik, J., Rootsi, S.
lived (1200 + 4350 + 4175)/2 = 4850 years ago. cultures can be viewed at present only as very tentative ones). 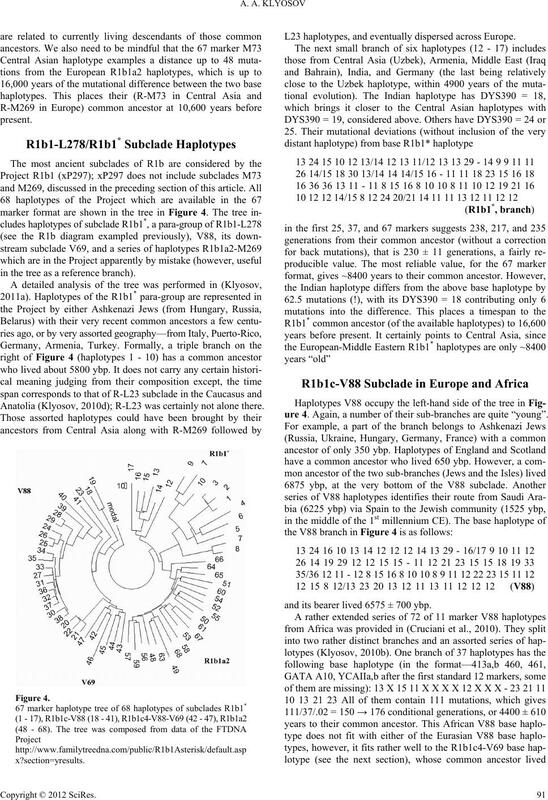 tor of the current R1b-V88 haplotype lived ~4400 ybp. ness to non-stop proliferation of R1b haplotypes. reaches—albeit not uniformly—some 60% of the population. a subject of another study. with the preparation of the manuscript. Balaresque, P., Bowden, G. R., Adams, S. M., Leung, H.-Y., King, T.
ers Today, Trento: Ufficio Beni Archeologici. Anatolia. Human Genetics, 114, 127-148.
ference for association scans. PLoS ONE, 3. Di Gaetano, C., Cerutti, N., Crobu, F., Robino, C., Inturri, S., Gino, S.
Sicily are supported by genetic evidence from the Y chromosome. European Journal of H um an Ge ne ti cs , 17, 91-99. 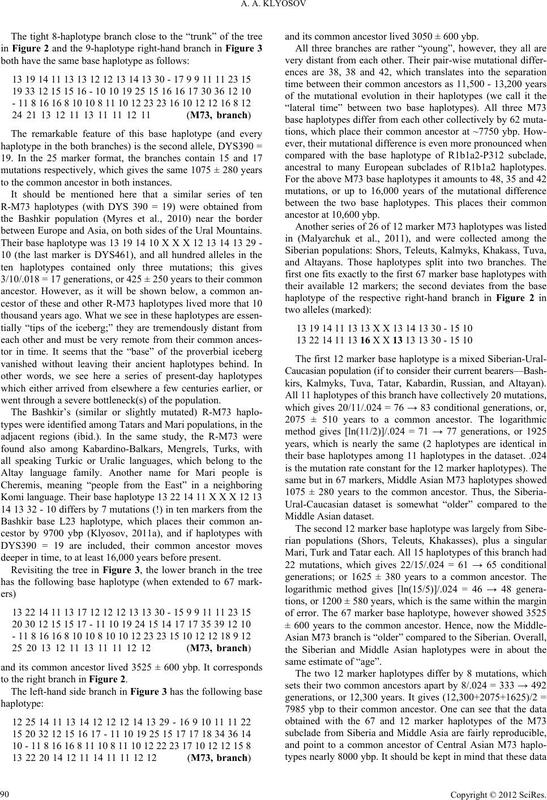 Journal of Human Genetics, 20, 313-320.
ogy, 1, 568-630 (in Russian). ceedings of the Russian Academy o f DNA Genealogy, 1, 54-232.
priesthood. Human Genetics, 126, 719-724.
sian Academy of DNA Genealo gy , 2, 1162-1181 (in Russian). and the method. 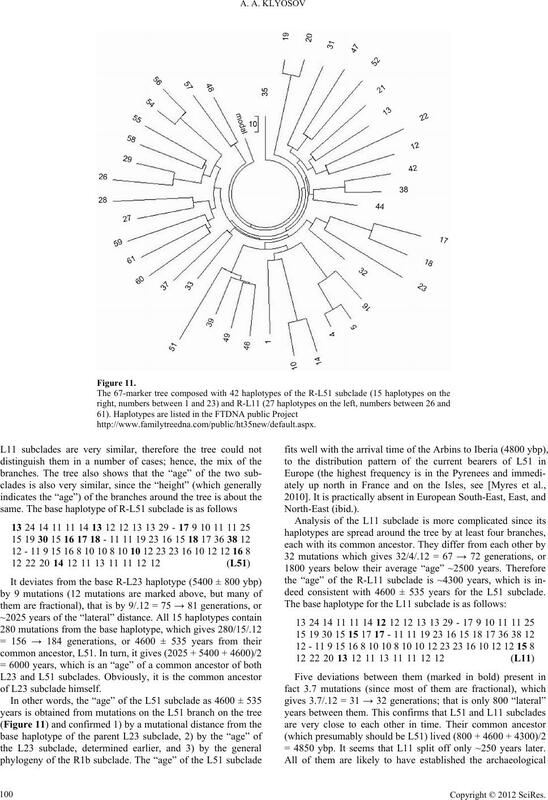 Journal of Genetic Geneal ogy, 5, 186-216.
historical evidences written in Y-chromosome. II. Walking the map. 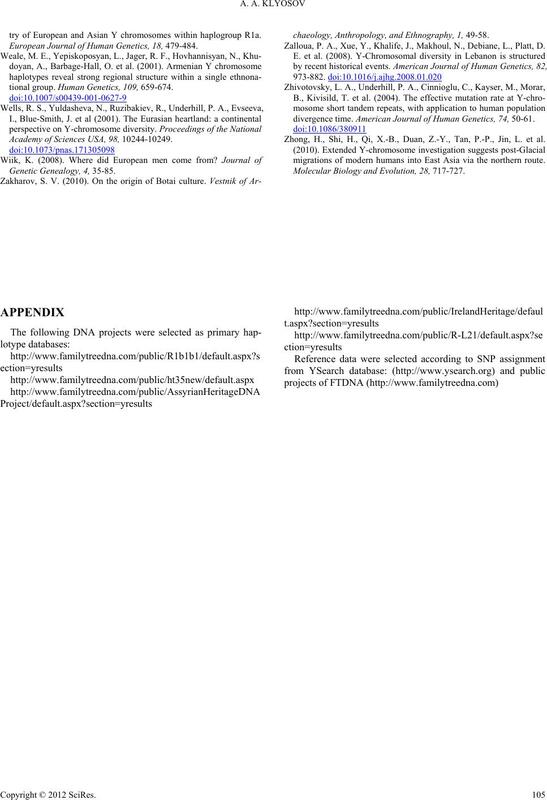 Journal of Genetic Genealogy, 5, 217-256. Klyosov, A. A. (2010a). Haplogroup R1b1 and its subclades in Asia. 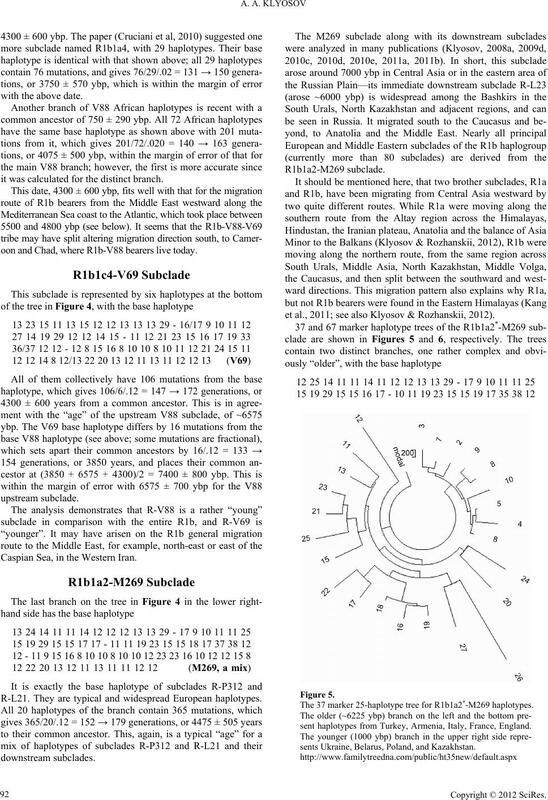 DNA Genealogy, 3, 1310-1315 (in Russian). of the Russian Academy of DN A G e nealogy, 3, 1029-1053. DNA Genealogy, 4, 2227-2245 (in Russian). 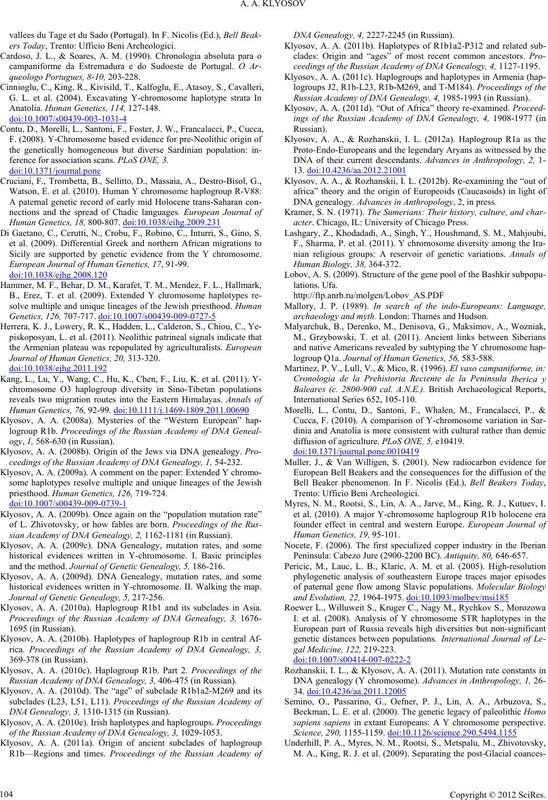 ceedings of the Russian Academy o f DNA Genealogy, 4, 1127-1195. Russian Academy of DNA Genealogy, 4, 1985-1993 (in Russian). DNA genealogy. Advances in Anthropo lo gy, 2, in press. acter. Chicago, IL: University of Chicago Press. archaeology and myth. London: Thames and Hudson. logroup Q1a. Journal o f Hu m a n G e n e ti c s , 56, 583-588. Myres, N. M., Rootsi, S., Lin, A. A., Jarve, M., King, R. J., Kutuev, I.
Peninsula: Cabezo Jure (2900-2200 BC). Antiquity, 80, 646-657.
sapiens sapiens in extant Europeans: A Y chromosome perspective. 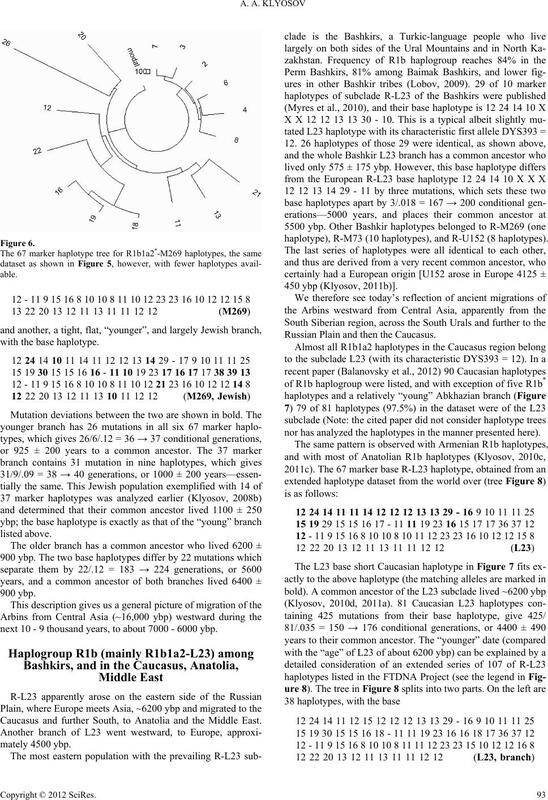 try of European and Asian Y chromosomes within haplogroup R1a. European Journal of Human Ge net ics , 18, 479-484.
tional group. Human Genetics, 109, 659-674. Zalloua, P. A., Xue, Y., Khalife, J., Makhoul, N., Debiane, L., Platt, D.
divergence time. 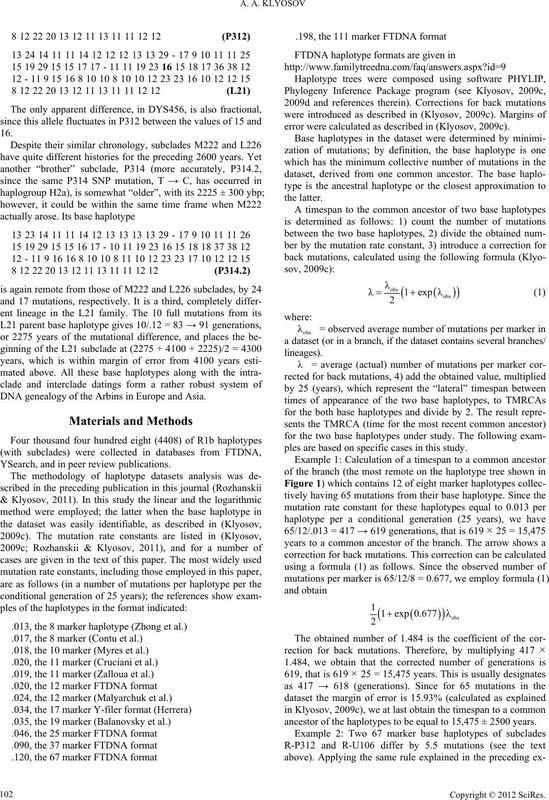 American Journal of Human Genetics, 74, 50-61. Zhong, H., Shi, H., Qi, X.-B., Duan, Z.-Y., Tan, P.-P., Jin, L. et al. migrations of modern humans into East Asia via the northern route. Molecular Biology and Ev o luti on, 28, 717-727.